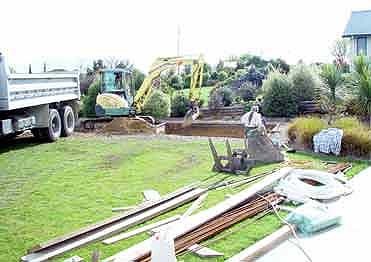 This is a critical stage as this dictates the permanent location of the pool and the setting of elevation (by laser level) in relationship to the adjoining structures. 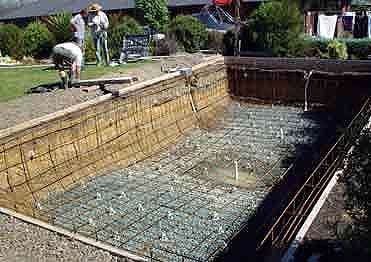 This is where you can really see the concept of the pool coming to life. 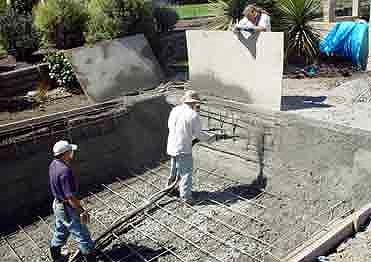 The shot crete (sprayed concrete) method does NOT require "over excavation' - greatly minimizing any possible damage to the garden, and subsequent settlement of paving around the pool, as with other methods of construction. 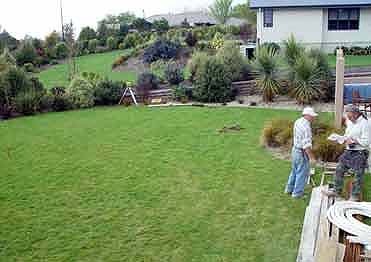 We take pride in our ability to minimize our impact on the area surrounding the pool (grass/plants, etc) - as you can see from our "before and after" photos. This is the skeletal framework of the structure. We use 3/8” reinforcing bars carefully placed to engineered specifications - the same engineering design that has been the standard of the industry for over 40 years in the US. 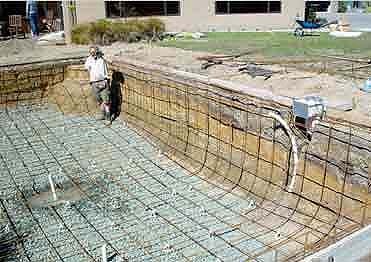 Next we install the water circulation system, drainage, lighting and any specialized water features. We use a circulatory system that creates a slight "current" - thus minimizing any possible stagnation. 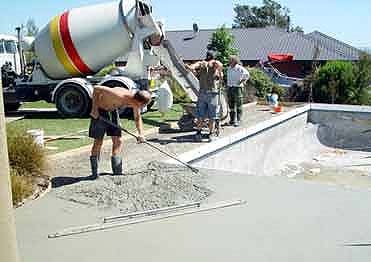 The real body of the pool comes to shape here. This is when we form the concrete shell by pneumatically spraying the concrete into place on the steel sub-frame. This creates a very dense seamless watertight basin 6 inches thick - that is incredibly strong. It is then 'water cured" for 10 days to maximize its structural integrity. 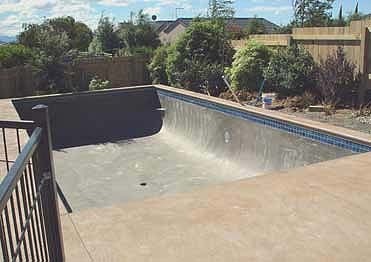 This is the first stage that incorporates a finished aspect of the pool. Customers can choose from our extensive selection, or we can advise them on other options. This photo shows the use of our 'canter lever' forming system which most of our customers choose. 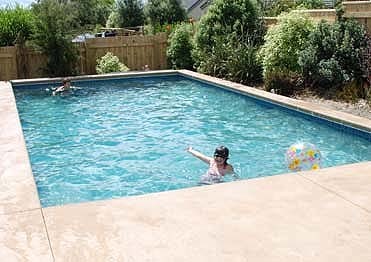 This produces a beautiful seamless curved edging around the pool, which is very durable. Plastering is the "icing on the cake" giving the final finishing touch. 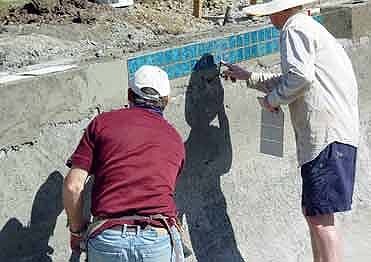 We hand-apply and trowel the plaster of your choice to a hard smooth finish. This photo shows the use of a "natural gray" - which is very popular. Though an array of other finishes/colors are available.